Click to read Connected by Shawna Ervin. Copyright remains with Ms. Ervin, who is graciously allowing us to post her story in support of Horse Ibachakali. With those words, Shawna Ervin asked for help from Cisco, her horse partner in Tapestry’s Horse Ibachakali program. 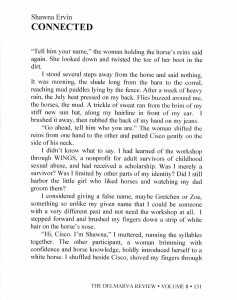 The way Cisco answered her plea for help was so healing that Shawna wrote a powerful essay entitled Connected. The Delmarva Review, a literary journal, published Connected in their winter 2015 edition, and the essay went on to be nominated for the annual Pushcart Prize for the best-published essay in the country. Shawna participated in the program through Tapestry’s partnership with the WINGS Foundation of Denver, Colorado, which helps adult survivors of childhood sexual abuse. Horse Ibachakali teaches people how to reconnect to nature through the unique combination of horses, mindful awareness, and Indigenous worldview. Ibachakali is a Choctaw Indian word for “connected” or “connection.” The program explores connections of many kinds between people and the natural world, which includes the inner as well as outer landscapes we all inhabit. With Shawna’s permission, we are posting Connected for you to read so you can get a glimpse of how Horse Ibachakali transforms lives. When you read it, pay close attention to what Cisco does with Shawna.